Catch: Draw two cards from the deck or pool. Raise: Exchange cards with the pool, crabs for crabs. Trade: Exchange cards with the pool, points for points. Upgrade: Discard cards to upgrade gear level. 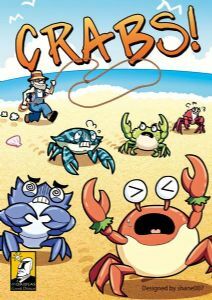 Tie Crabs: Discard cards to gain a score card. Relax: Untap up to three score cards. At the end of your turn, you can choose to trade score cards for a single objective card, then you must discard down to eight cards. When a player has gathered 25 or more VP, the game continues until all players have had the same number of turns, then the game ends and whoever has the most VP wins!